This is probably as close as any of the Yes members have come to making a Yes album on their own, and it remains a fan favorite. Kronomyth 1.0: Hear is hear. 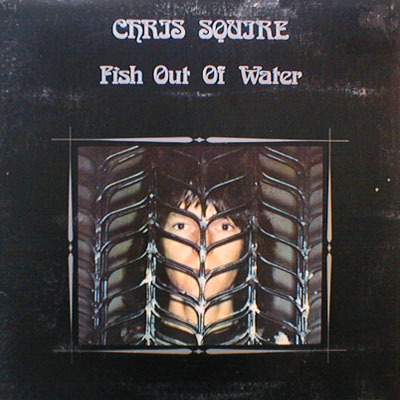 Chris Squire’s first solo album takes its name from his “solo” contribution to Fragile, “The Fish (Schindleria Praematurus),” and finds the Yes bassist and backing vocalist swimming in the same turgid waters for forty minutes with an orchestra and a few familiar faces (Bill Bruford, Patrick Moraz, King Crimson’s Mel Collins). Initially, I found the whole thing overdone, a toppled wedding cake compared to the airy wafers of Jon Anderson’s Olias of Sunhillow. And while I’d still concede Olias the upper hand in the extracurricular adventures of Yes, the fact is that Fish Out of Water is a remarkably ambitious and often quite effective continuation of the progressive music of Yes. I’ll get the awkward bit out of the way early: the symphony. As a general rule, progressive rock musicians and symphony orchestras are a recipe for ridiculous excess. Fish Out of Water isn’t as egregious an offender as Journey to the Centre of the Earth, but let’s just say Squire and Andrew Jackman don’t hold anything back for the finale of “Safe (Canon Song)” save for actual cannons. “You By My Side” features similarly ham-handed orchestration, yet even slightly bruised it’s still a beautiful song. Those are the only two tracks that suffer from orchestral overindulgence; the rest of the record is just the sort of muscular progressive rock you would expect from Squire, with an unexpected dose of melodic sweetness. In comparing this to the music of Yes, it’s as though Squire has replaced Steve Howe’s guitar with a second bass guitar. Otherwise, his vocals suggest a less angelic Jon Anderson, Bill Bruford stars as Bill Bruford and Patrick Moraz does a decent Rick Wakeman impersonation on “Silenty Falling.” For “Lucky Seven,” Squire creates an impressive bass riff that underpins the entire track and then adds Mel Collins’ jazzy saxophone on top of it to give it a distinctly un-Yeslike edginess. It would be tempting to view Squire as the yang to Anderson’s ying, a comparison that Fish and Olias bears out, but to my mind the two players are more about commonality than duality. If you superimposed the thick, structured sounds of Fish with the celestial sounds of Olias, you’d have the makings for a completely new Yes album minus the guitar heroics of Steve Howe. In fact, Fish Out of Water makes plain that Squire is not only a founding member of Yes, but its musical foundation. Like I said, my initial reaction to this album was ambivalent, but it’s grown on me since then, and I would rank this today among the most interesting parallel journeys in Yesworld. All titles written and arranged by Chris Squire. 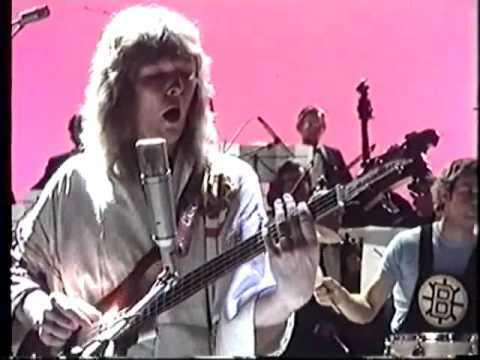 Chris Squire (basses, twelve string electric guitars, vocals), Bill Bruford (drums and percussion), Andrew Pryce Jackman (acoustic & electric pianos, orchestrations, conductor, invaluable assistance & encouragement) with Adrian Brett (woodwind leader), Jim Buck (horns leader), Mel Collins (saxophones on A3/B1), Julian Gallard (string leader), Jimmy Hastings (flute on A2), Patrick Moraz (organ & bass synthesizer on A3), Barry Rose (pipe organ on A1), Pete Sinfield (suggestions on B2), David Snell (harpist), Nikki Squire (vocal help on A1), John Wilbraham (brass leader). Produced by Chris Squire; sound engineered by Greg Jackman; finishing touches by Trevor Spencer & Graham Presket. Album cover design & photography by Laurence Bernes. Front cover Polaroid by Brian Lane. Released on elpee, cassette and 8-track on November 7, 1975 in the UK (Atlantic, K/K.4 50203), the US (Atlantic, SD/TP 18159), Japan (Atlantic, P-10068A), the Netherlands (Atlantic, ATL 50203) and in 1976 in Argentina (Atlantic, 5014214) and Brazil (Atlantic, 404047) with gatefold cover, picture innersleeve and poster; reached #25 on the UK charts and #69 on the US charts. Re-issued on compact disc on February 25, 1990 in Japan (Atlantic/MMG, AMCY-19). Re-issued on compact disc on January 15, 1996 in Germany and the Netherlands (Atlantic, 81500-2). Re-released on Deluxe Expanded Edition CD+DVD in 2007 in the UK (Castle) with one bonus track + bonus DVD. Re-released on super high material compact disc on April 22, 2015 in Japan (Atlantic, WPCR-16324). Re-released on 2CD+2DVD+LP+7-inch singles set on April 27, 2018 in the UK (Esoteric, PECLEC 42620) with a boatload of extra stuff.